I am exhausted from a great weekend of entertaining friends and family, but can’t seem to sleep. I’ve been looking for the “right time” to launch this sucker and taking the in the sweet embrace of insomnia seems just right! What a perfect way to introduce myself: a late night post featuring several of my favorite things (i.e. 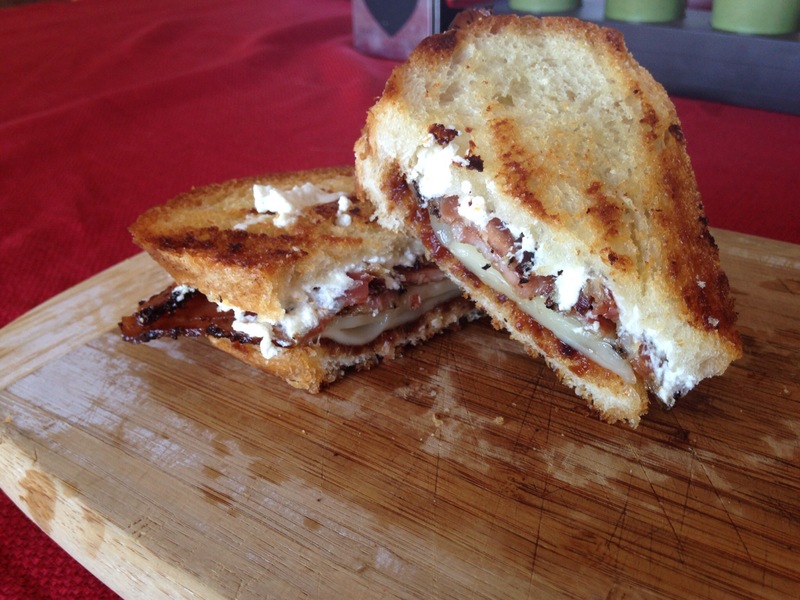 goat cheese, bacon, bread and figs). I came up with this delicacy after seeing an idea on Pinterest that used Brie, but sadly ours was past its prime. Enter goat cheese, which is honestly one of my favorite of all cheeses. It’s a shame how long it took me to open my palette to such an exquisite flavor, but more on that some other time. To begin assembling this sandwich, I baked the peppered bacon on a baking pan lined with parchment paper – about 20 minutes at 375 degrees. I also sliced the bread and set the goat cheese out to soften during that time and made sure I had softened butter on hand. Once the bacon was perfectly crisp, I slathered one slice of bread with the goat cheese and the other slice with fig butter. I put the softened butter on a grill pan that I preheated on the stovetop. With the burner set to medium, I put the plain sides of the bread down on the pan. After each slice was golden brown, I piled on the bacon, put the bread slices together and proceeded to demolish the whole thing. I hope you will, too.